Fido. Lassie. Spot. They’re man’s best friend. So, why do we stick them in stuffy, dirty doghouses? And what about Fluffy Kitty… she’s outside in bad weather, too. Sharon Jones didn’t think it made sense… and she was right. She believed dogs and other pets needed shelter from the rain, protection from the sun and a comfortable spot all their own to stretch on. Sharon brought her idea to Davison and the Cool Cot House has been for sale in dozens of pet supply stores and online retailers. 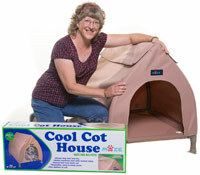 A comfortable pet bed that can be used indoors and out, the Cool Cot House is lightweight and portable. It features a heavy-duty, water-resistant canvas cover with mesh vents at the top for increased air flow. Plus, the canvas flaps roll up and down depending on the weather. A comfy mesh bottom also keeps pets cool and elevated.